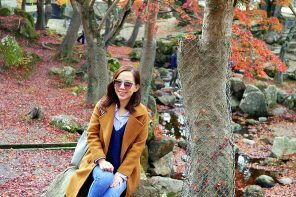 On our fifth day at Seoul, South Korea, we visited Ewha Women University and it’s surrounding. 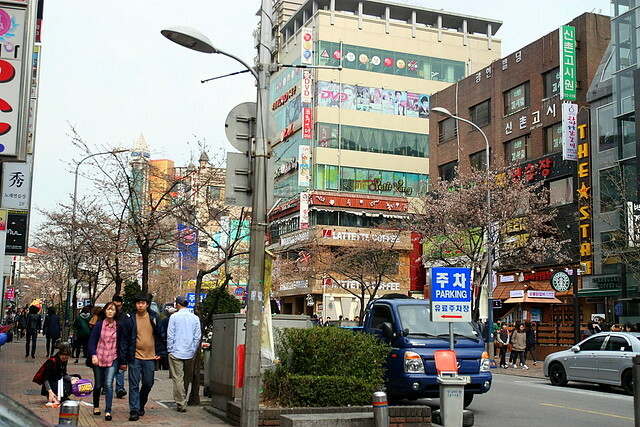 From there, we also walked to Sinchon area and Hongik University area. 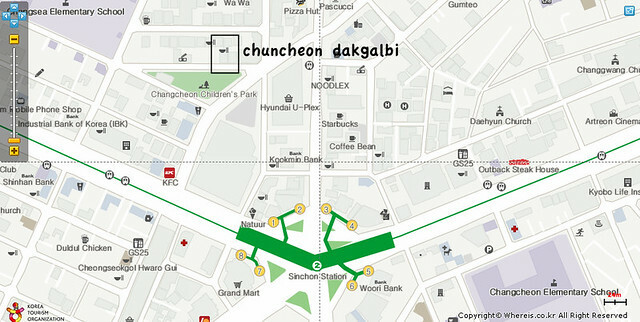 The subway stations of these three areas are adjacent to each other. 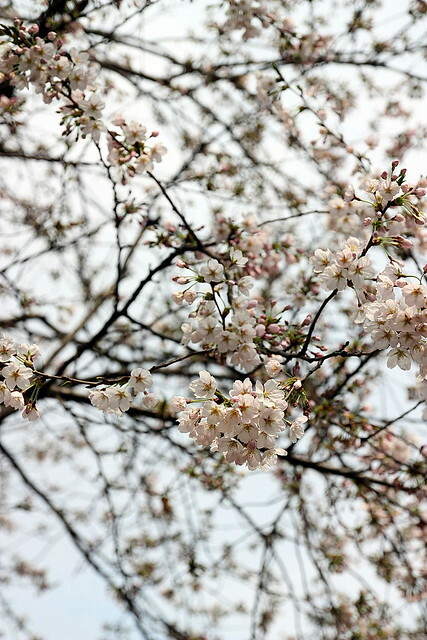 We were fortunate enough to be at South Korea during mid April as cherry blossoms begin to peak. 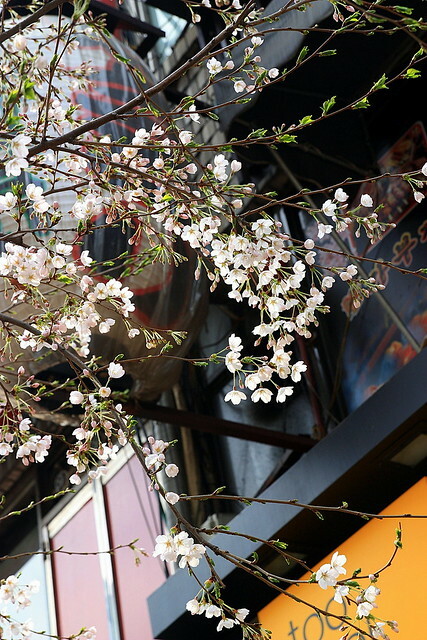 This picture shows beautiful cherry blossoms lining the busy walkways of Sinchon, Seoul. However, we were not here for cherry blossoms as the best place to view them is at Yeouido, there’s even Hangang Yeouido Spring Flower Festival (여의도 봄꽃축제) which we went to towards the last day of our trip. 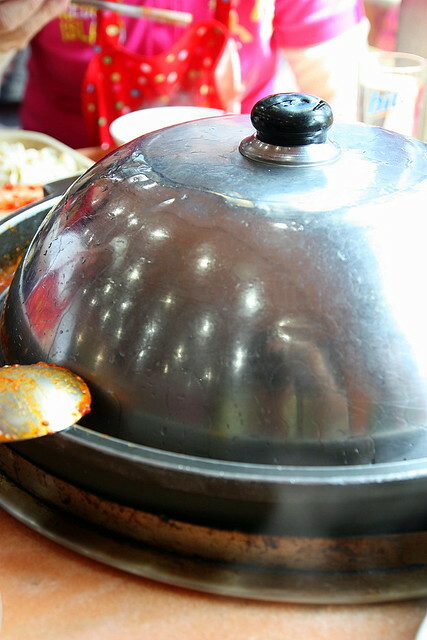 Yes, we were here for this restaurant called Chuncheonjip Dakgalbi Makguksu in Sinchon, an area surrounded by universities and populated by students. Upon arriving, the wait staff passed us a big plastic bag in which we threw in our jackets and bags to prevent them from smelling of food. 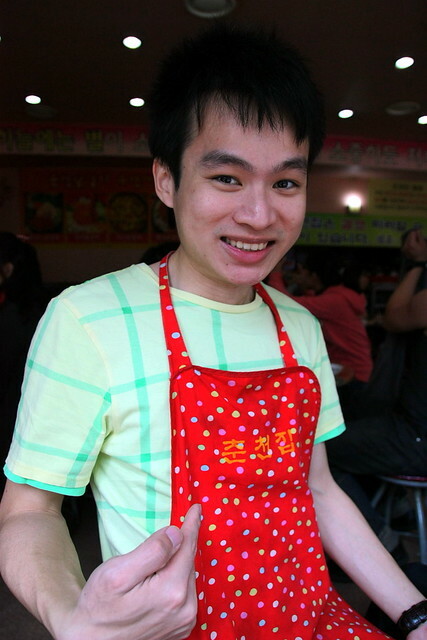 We have to wear these bibs to protect our clothes from getting stained too. 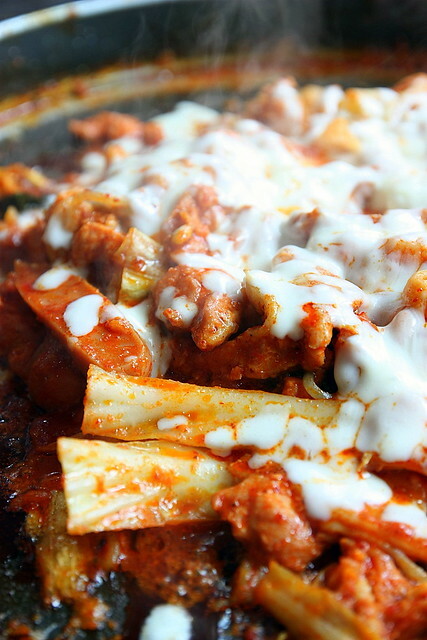 Chuncheonjip Dakgalbi Makguksu (춘천집닭갈비막국수)’s most popular dish is Dakgalbi. 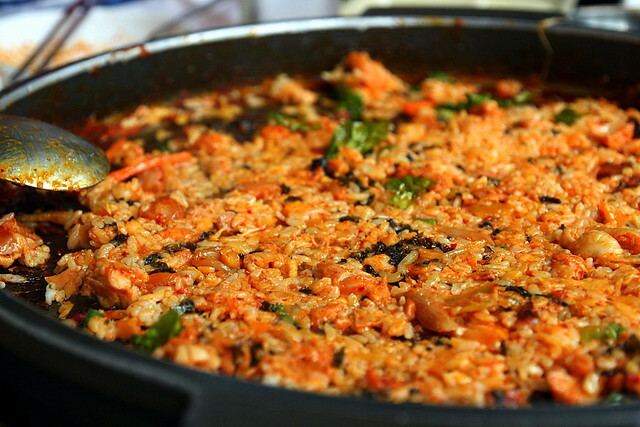 Dakgalbi originates from Chuncheon, Gangwan Province. 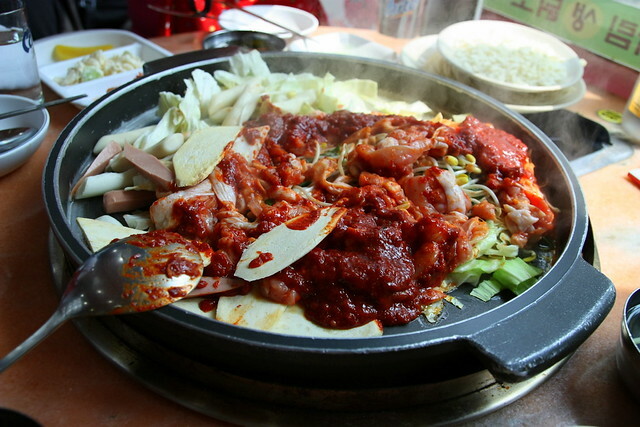 Hence the dish is also called Chuncheon Chicken (春川炒辣鸡). 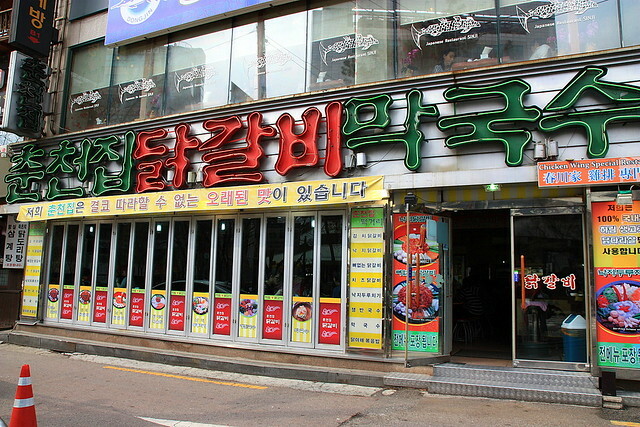 It is also known as the commoners galbi or university student galbi because of it’s huge portion and reasonable pricing. 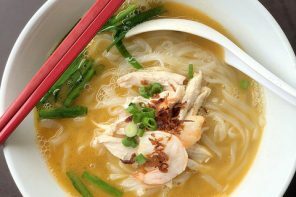 So occasionally, tummy fillers like cheese, ramen, udon and rice are thrown in. 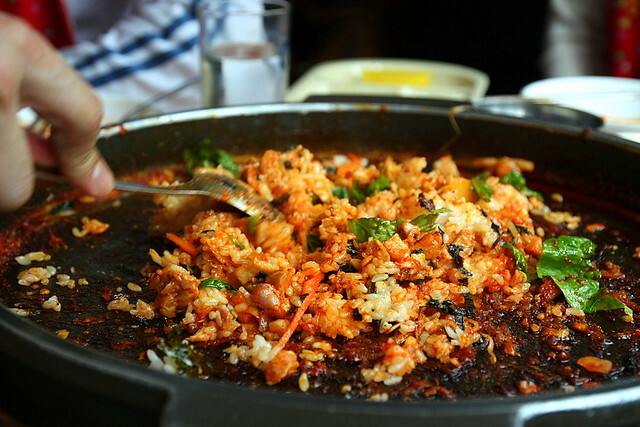 A standard dakgalbi set for one costs 6500-7000 won. We ordered three sets to be shared amongst us. Our order came with marinated boneless chicken in spicy red pepper paste , sausages, rice cakes, sweet potatoes, cabbages, bean sprouts and tteok (rice cake). The wait staff did most of the cooking so we just sat back and relax! 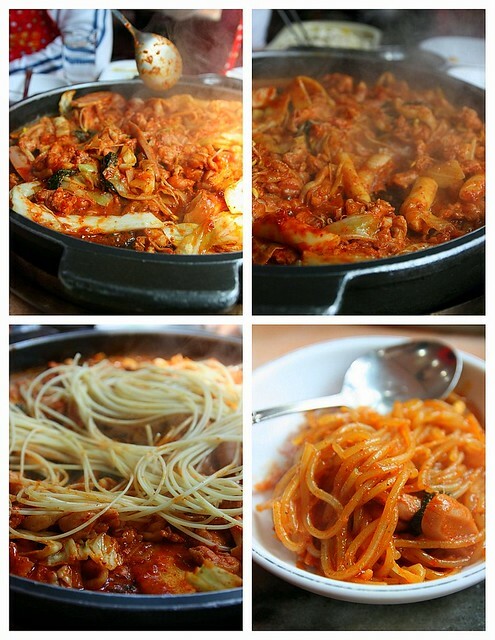 The staff also added in strands of spagetthi noodles to the chicken as it cooks. When done, the wait staff placed the spaghetti onto our plates and instructed us to start eating. He then added the mozarella cheese onto the remaining ingredients. The cheese, all golden and bubbling looked really tempting. It was really delicious! When were were left with a quarter of the food, the wait staff added rice to stir-fry in the pan to soak up the extra, flavorful sauce! The result was the best part of the meal! 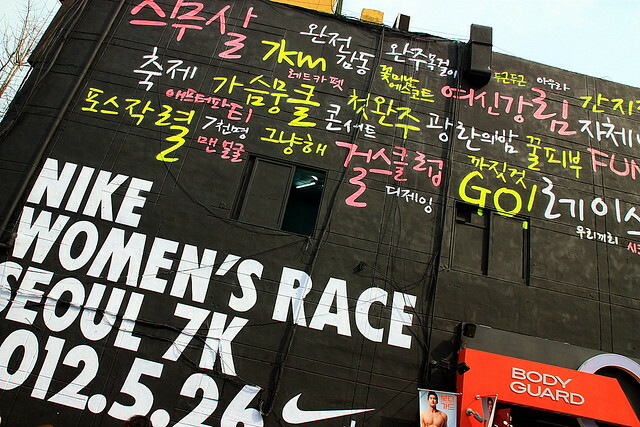 Address: 57-8 Changcheon-dong, Seodaemun-gu Seoul South Korea. Operating hours: Opens from 10am to 6am the next day. 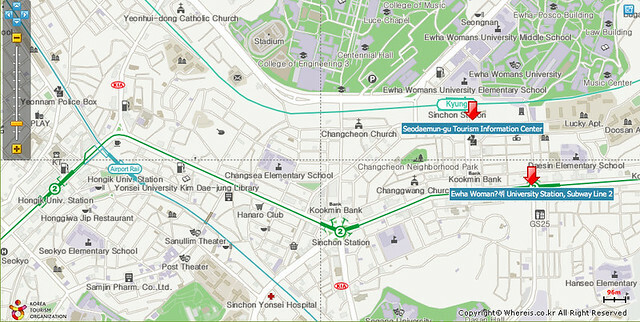 The restaurant is next to Changcheon Children’s Park (창천어린이공원). 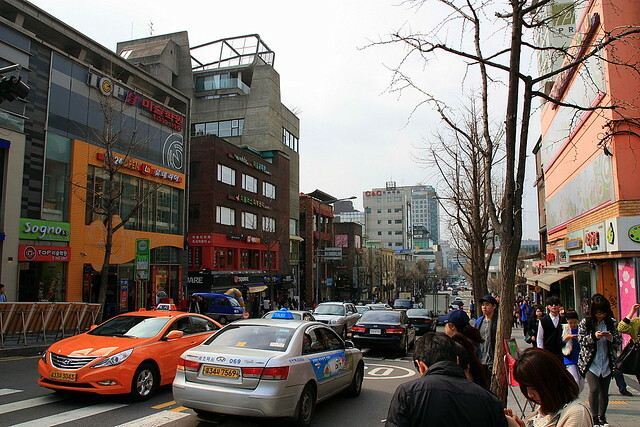 After lunch, we proceeded to Hongdae/Hongik University area. 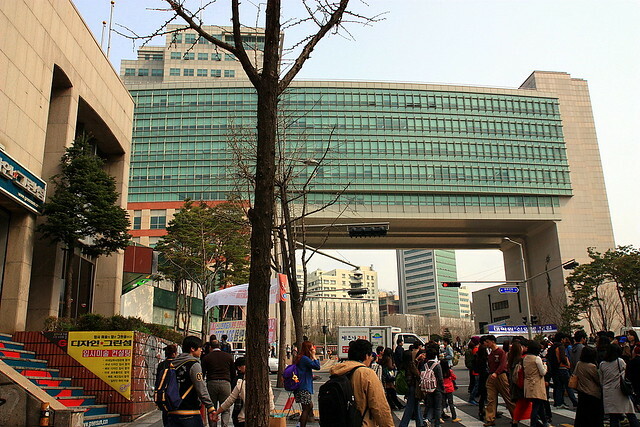 It has the most well known school of Fine Arts and Design in Korea and has built cutting-edge facilities on the campus. We also recognised the university by this structure that is shaped like a rectangular arch. 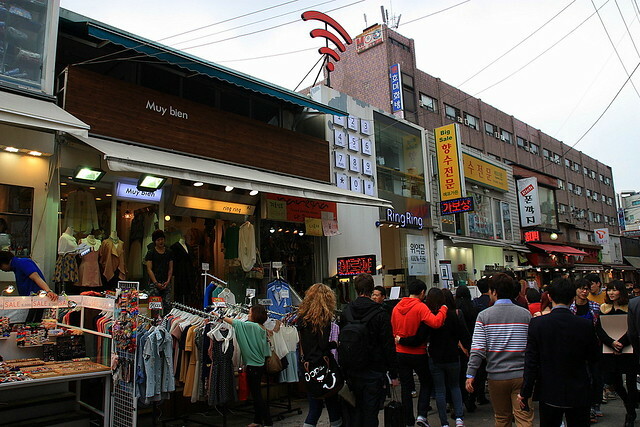 In the area surrounding Hongdae/Hongik University, a street art exhibition is held every autumn. 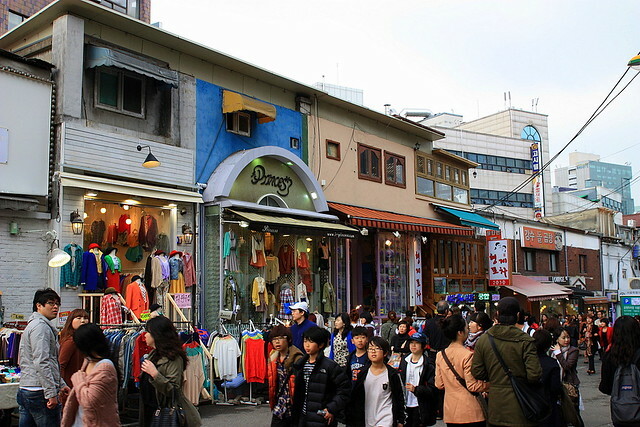 Young artists from all over Korea flock to the Hongdae area, so the area has a vibrant culture. 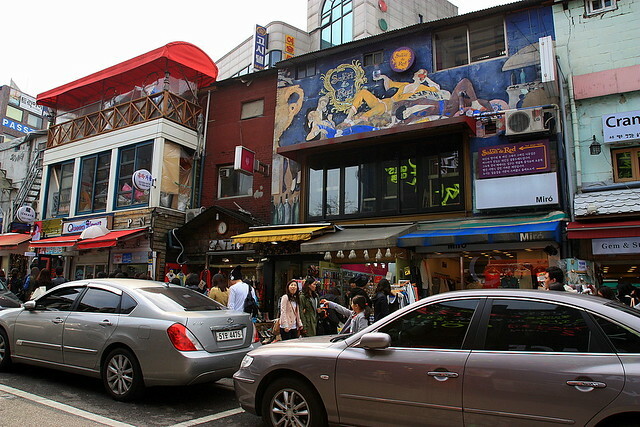 Hongdae/Hongik University area is also the center of Korea’s nightlife, and most youngsters cisit the clubs on Friday or Saturday night and enjoy dancing and music. 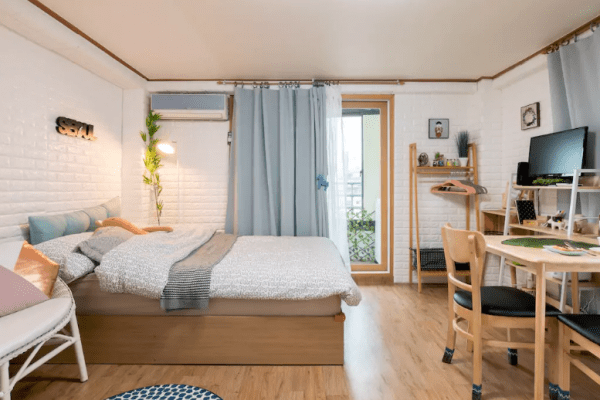 If Ewha Women University and it’s surrounding area is the sweet and feminine younger sister, then Hongdae/Hongik University area is definitely the hip and cool elder sister. 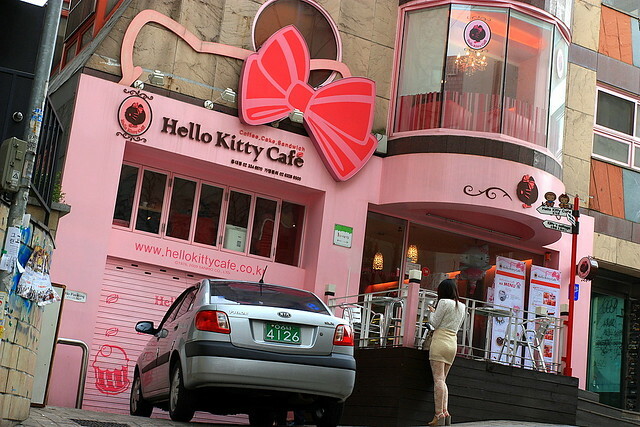 There are a lot of nice, cute and artsy cafes around this area too. 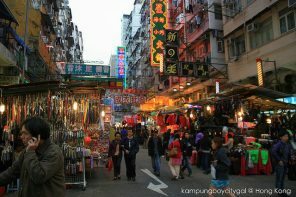 Be adventurous and venture out into the small side streets. There are a lot of interesting trinkets, clothings and accessories. 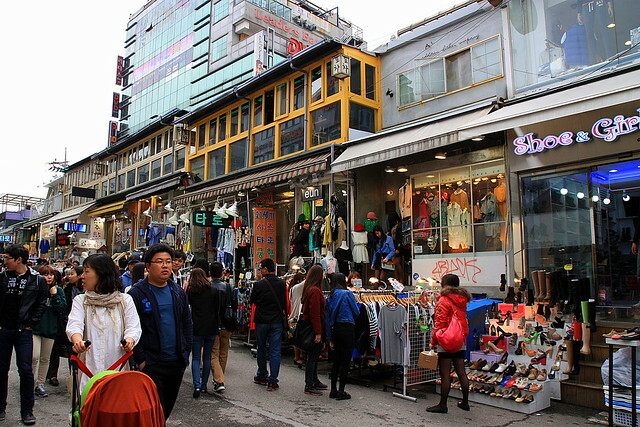 Every Saturday from 1pm to 6pm, there is a Hongik University Flea Market. 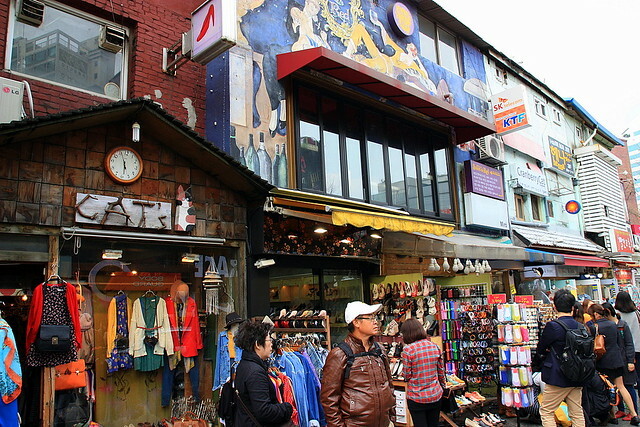 Works by amateur artists are sold here. Visitors can produce a work of art in collaboration with an artist and share their opinion about the world of art and creation. 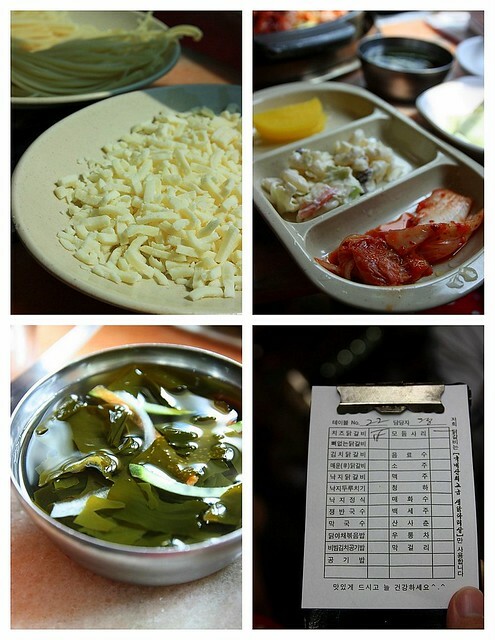 very nice write-up 🙂 forChuncheonjip Dakgalbi Makguksu, do they have non-spicy menu?